1. Raise and support the vehicle (see page 1-13). 3 . Install suitable flat washers (A) and the wheel nuts. 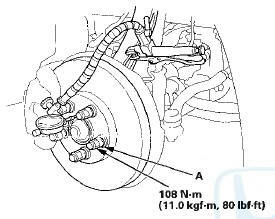 Tighten the nuts to the specified torque to hold the brake disc securely against the hub. 4. Attach the dial gauge. Place the dial gauge against the hub flange. 5. 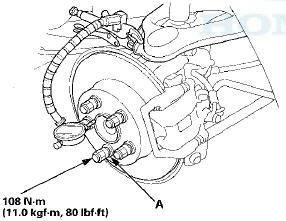 Measure the bearing end play while moving the brake disc inward and outward. 6. If the bearing end play measurement is more than the standard, replace the wheel bearing or the hub bearing unit.